IFP’s soft x-ray analytics facility WERA at ANKA provides a coherent combination of electron spectroscopies and microscopies for studying in detail the chemical (electronic) and magnetic structure of bulk materials, thin films, and micro- and nanostructured objects. 3 additional persons visible within KIT only. Three experimental stations at WERA equipped with PEEM, electron energy analyzer, detectors, cryostats, etc. Fig. 1: Part of the cluster of experimental stations, preparation chambers, and loadlocks at WERA. The PEEM is located near the center. The excitation (photon) energies are in the soft x-ray range from 100 –1500 eV, which is especially well suited for studying the light elements (like oxygen), the 3d transition metals, and the 4f rare-earth elements at their particularly informative K, L, and M edges, respectively. In the soft x-ray range, radiation-induced damage in, e.g., carbonaceous materials is orders of magnitude less than with electron bombardment (like for EELS in TEM). The photon energy resolution ΔE/E can be chosen as low as 10-4. The main instrument for KNMF applications is the photoemission electron microscope (PEEM). Using electron optics with great magnification, the lateral distribution of electrons emitted from the illuminated spot on the sample is imaged to an intensifier and CCD camera. The lateral resolution in PEEM can be better than 30 nm (100 nm in spectromicroscopy), and this as well as the variable probing depth of <1 to about 10 nm, depending on technique, is well matched to many nano- and microstructured materials and their typical length scales. Generally, the methods are element-specific. Imaging of chemical (electronic), magnetic, and topographic contrast. The field of view can be chosen from 250 µm down to about 20 µm. Using the sample translation stage, a total sample area of up to about 10 mm diameter can be studied. Spectromicroscopy: this is an especially powerful PEEM application: by taking stacks of images while tuning the photon energy or the kinetic energy of the detected electrons, laterally resolved sets of x-ray absorption (µ-XAS) and photoemission (µ-PES, µ-XAS) spectra, resp., are efficiently obtained and can be further analyzed, see figure 2. Field of view and accessible sample area are the same as in (1). The polarization of the synchrotron radiation is a further useful variable: with circular polarization, for instance, ferromagnetic domains become visible (“magnetic dichroism”, µ-SXMCD), see figure 3, and the associated spectromicroscopy gives element-specific magnetic information such as on spin and orbital magnetic moments. Linear polarization of the incident light makes the experiment sensitive to parameters like molecular and bond orientation. In addition, WERA comprises further, complementary stations for XAS, PES (XPS), and SXMCD. There, the signal is averaged over the illuminated spot on the sample (typically 1 x 0.5 mm2). This allows higher energy resolution and even greater flexibility in detection methods, polarization, and sampling depth (including fluorescence detection for bulk-sensitive XAS measurements). The sample environment includes temperatures between 15 and 800 K and high magnetic field (currently 2 T). ANKA will ensure an even wider range of possibilities for preparation and characterization. All methods at WERA are embedded in both the KNMF and the ANKA user landscape. The WERA personnel has a strong commitment to user support. Please discuss your application with us. WERA is constantly being upgraded and expanded. Major upgrades include: (i) an undulator as a second, alternative light source for experiments needing higher photon flux density on the sample; and (ii) expanding the magnetic fields available for SXMCD to 7 T.
All experiments are performed in ultrahigh vacuum at pressures in the 10-10 mbar range. Samples should be compatible with this. Nanolithography of phospho¬lipids by the dip-pen method (see KNMF Laboratory for Micro- and Nanostructuring). The written triangles are 10 µm wide. The increasing admixture of nickel-chelating lipids (with a single Ni atom per lipid macro-molecule) to the carrier appears in this Ni-sensitive, spectro¬microscopic image as the increasingly red-yellow colors visible from bottom to top. Quantitative analysis reveals that for the lower four triangles, the admixture ratios observed in the written patterns directly track the original values. For the top triangle, some demixing seems to set in, leading to a smaller than-expected fraction of Ni-chelating lipids actually arriving in the written pattern. (Cf. S. Sekula et al., Small, 2008). 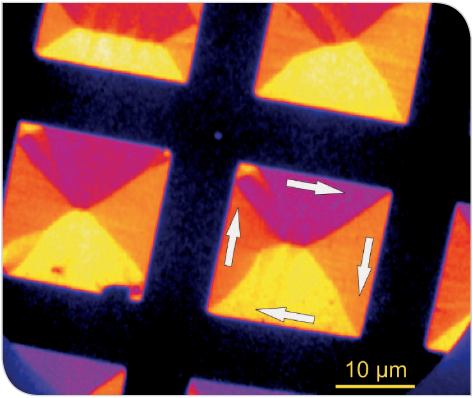 Magnetic domains and possibly defect-related subdomains with various orientation are visible in this magnetic dichroism image of thin film permalloy squares.